The book has high historical accuracy and was clearly researched thoroughly by the author. My favourite part of the book is when the characters realise that they are stranded on the Stac and begin to wonder about what will happen to them. I would have lied to see more pacing at the beginning of the novel. I really liked this book, and how it unfolded over the chapters. The sense of trauma was really emphasised throughout the book and to the end. I liked how it incorporated the history of measles and how some of the characters that Quill was dying to see when he got back to St Kilda had died. This made it more realistic. My favourite part was the entire build up of hope to insanity at the end. Quill was the creative, level-headed leader of the group but the stac and its pressures led him to be confused and delusional towards the end of the book. I also liked hoe when Murdina visited him in his dreams, how it was hard to distinguish whether it was real or not, further creating that sense of confusion and trauma. I loved this book and was very sad when Davie died and Quill was blamed, but I realise that was a good storyline. I gave this book 4.5 stars out of 5 stars. 'Where the World Ends' by Geraldine McCaughrean is an exciting and profound historical novel set on the remote archipelago of St Kilda in the North of Scotland. The book is centred around the central character Quilliam, a boy of 14, who is sent with a group of men and other boys to harvest birds from a sea stack. When the boat fails to return to collect them, they are forced to survive alone on the isolated pinnacle of rock. The group believe that the failure of the boat to return is due to 'God making his kingdom on Earth' signifying the end of the world and inspiring the book's title. They become increasing wild and lawless and the book grows in tension towards its final conclusion. The character of Quilliam changes throughout the course of the book as he is forced to grow up and, through his storytelling, comfort the other boys. By the end of the novel though he has become disillusioned with life on St Kilda to the point where he considers abandoning his home for the mainland. Geraldine McCaughrean creates a very convincing and evocative world- an accurate recreation of 1727 and the brutal hardships of life on an island. We witness the importance of nature in the inhabitants; world and how everything is reliant on the bird harvest. The birds provide them with food and even act as candles with a wonderfully drawn picture ofstorm petrels burning down from head to foot until at least each of their flames went out. The landscape of the sea stack is brutally harsh and is a place where the desperation of the community to survive is made plain. The sea that surrounds it is a wild place with 'water which folds itself into hills and valleys' suggesting something untameable and uncrossable. To be left on the sea stack is to be abandoned by the world. I really enjoyed the book and, clinched as this sounds, couldn't put it down. The setting was both terrifying and interesting and this provided a great backdrop to an exciting and tense story. I highly recommend it. I did not really ie this book because it did not really interest me at all and it went on quite a bit at the start. I did not really get to finish it because I did not like it and it was not really very interesting. This book did not really have all the things I was looking for such as adventure, thrill, a good plot and excitement. Just because I have said that I do not really like it,though, it does not mean that it is a rubbish book because everyone has a different sort of taste and some people might actually end up liking this book if they read it. It just isn't to my taste.Â This book is about boys who go to a rock in the sea and kill birds to bring back for food to their home. 'Where the world ends' is about the summer of 1727; a group of men and boys harvest birds and eggs were stranded on Warrior Stac, on the pea of rock that pitches out of the Atlantic. 'As black and fearful a one horn of the Devil himself'. It was nine months before anyone came to collect them. Geraldine McCaughrean has taken these bare facts and imagined the story of those terrible months and the characters of those who underwent them. A story of survival!Â Despite this, I did not enjoy the book. I felt that the story line was increible, however she did not tell the story very well. She tended to ramble on and on throughout the book. In my opinion the history of the book wasn't very accurate and I lacked interest. However she was able to create a clear image because of the amount of description that she used. In addition it was hard to focus and understand the book as she jumped from one idea to the next. The book was unrealistic, although nearly all the best books aren't realistic. In conclusion, this book had more bad qualities than good, and I wouldn't recommend it to others. I really enjoyed reading this book. I would recommend this to people who enjoy history and culture. Out of 10 I'd rate this 8 as historical accuracy is ok, but in parts tails away slightly into fantasy. My favourite character was the main character Quilliam. He is brave, curious and for most of the book very hungry as the storm patrol supplies were low. He is obsessed with Murdina Galloway, the girl who lived on the main land of St Kilda. Murdina also frequently appears in Quilliam's dreams causing the other island inmates to accuse the girl of witchcraft. My favourite event was who Mr Farris was about to kill himself, but Quill and the whales prevented that from happening. I would sincerely recommend this book to young readers. Where the world ends is a brilliant historical novel set in 1727, based on a true story set in St Kilda. Its about a bunch of boys/men who were sent fowling on a island, and are left there. They visit the island, Warriors Stac, on the premise that the boys would go home less of a boy and more of a man.During this trip the boys face many hardships ,that all revolve around the fact that the ship that dropped them off never came back. Examples of these hardships are starvation, frostbite and the fear that they have been forgotten. What particularly touched me about this book is the fact that after facing all these hardships, in a way the boys quest for salvation still ended in failure, seeing as when they arrived home all but one person on there entire island had died from small pox. This book was rather depressing yet still exciting because everything wasn't as it originally seemed ,one of the characters John, supposedly male, turned out to be female. It was also filled with many interesting pieces of history and semi-useful facts like how to catch a gannet, though these facts mainly just emphasised how stupid the boys and the birds on the island were.I particularly loved the fact that there was a guidebook about the birds at the end of the book, which I spent a great deal of time reading. The book ˜Where the world ends' was a thoroughly great read. I was shocked that it was based on a real event and something so tragic could actually happen. Some aspects were changed; however, at the back of the book it contained the real events. It also made me realise how valuable and different things were back then. Nowadays if we are stranded we have ways to communicate but back then they would have been isolated. Also our resources have developed, we now have plenty of boats, food and medicine to treat diseases like gangrene. Back then they would go to extreme measures to harvest food; the oil that they tied in guts we can now store in other ways. Not only have our materialistic ways changed, but our religious. Back then they were very strict and superstitious, believing in omens and visions. I was flabbergasted that 'John' could go most of her life thinking she was a boy when really she was a girl. That would never happen to someone today. Things have changed but others have stayed the same. Like our actions, emotions and reactions, stranded alone the boys and John would grasp onto hope the minute it was in their sight. When reading the author's note I became sombre. In the book a handful of families survived smallpox; however in real life only one did. Had that been now, medicine and vaccinations could have saved them. This book tugged at my heartstrings, leaving me on a roller-coaster of emotions. It delved into all possible feelings; sadness, happiness, curiosity, anger, spitefulness. Each time becoming a different character, embracing how they felt. This is one of the best books I have ever read, containing many elements, including history. Where the world ends is a historical adventure novel that is set in 1727. As the story was based on not very well known historical events, the author would have had a very difficult time, as they would have to have balanced the normal research and note taking that is paramount to a historical novel, while also grappling with the difficulties of finding reliable information on a little known historical occurrence. Geraldine McCaughrean, however, flew through these obstacles, and the final product combined just the right mix of adventure, history, and empathy for the characters' feelings and personalities. The setting was vivid and well described, as were the characters, and the clear storyline combined with McCaughrean's own personal touch created an astounding novel about leadership and loss. At this moment, even after closely analysing it, I cannot find any faults with, as it is clear and not at all frivolous. I particularly enjoyed the way she expressed the novel in a second person's point of view, as although it is more difficult to express the characters emotions this way, she managed it, and this gave the book a unique style and one that is rare in YA books. Sometimes using this technique can result in a disjointed and vague novel, but this was certainly not one of those cases. I enjoyed the narrative from Quill's point of view as it was interesting to see the events unfold from a Birdseye perspective, and I also thought the character of Quill was strong and well portrayed. The history in the book was definitely believable; however this story had a more focused perspective on the novel point of view rather than the Historical, and it unfortunately did not make me want to investigate its set time period. I will have to read more of McCaughrean's books to compare them to this one; however I would, overall, thoroughly recommend this read with a rating of 5 stars. 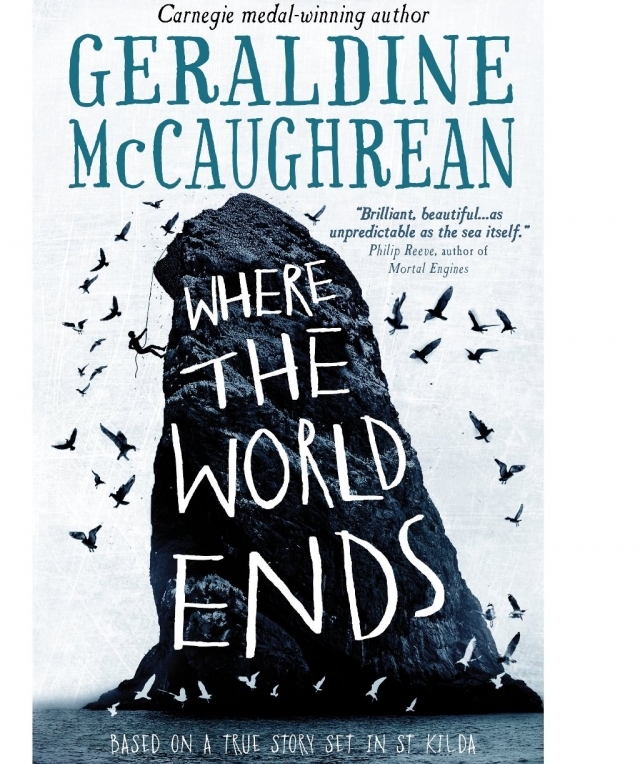 'Where the World Ends' by Geraldine McCaughrean is a fiction book based on real events. The author also wrote the official sequel to Peter Pan when she entered a competition and won it. She has also written six other historical novels aimed at adults and children's fiction books. 'Where the World Ends' is set in Scotland in 1727, when Hebrideans would visit St Kilda to kill sea birds. This story follows Quilliam and other boys. They were going to a remote sea stac to harvest sea birds for food, feathers and oil. Disaster strikes when the boat they were expecting does not return to collect them. Their only theory for this is that the world has ended. I enjoyed this book because even in the long, tough winter months, the author kept control of the book therefore it was not drowned with dreariness and sadness. She had a way of keeping the book exciting even when they were struggling to survive. Also, I loved the little quirks and values that made the uniqueness of each character, for example, Quilliam's excessive use of story-telling to distract everyone from their horrible situation. Historically, I think the book was portrayed well. It highlighted the importance of capturing the sea birds to the Scottish. Also, there was a sense of gender inequality throughout the book, with men treating women differently as opposed to other men. Little historical details like this really made the book come alive for me. Overall, I found this book a fun read and would recommend to absolutely anyone over the age of eleven, as it might be a little bit confusing to younger readers.